Everything is happening spontaneously, and the witnessing of it is also happening spontaneously. Everything is already happening in natural balance. A directed state of mind that focuses attention on certain prescribed thoughts that free the minds awareness, release mental and physical stress, remove limitations and rehabilitate creative power. A directed state of mind means that the practitioner intentionally and deliberately restricts the mind from thought and focuses on basic awareness using a prescribed focal point. By focusing in this way, we quickly discover an entire realm of mental activity that chatters away continuously in our consciousness and subconscious mind. Generally, we are processing multiple thoughts in parallel (simultaneously). We have more awareness of some thoughts and less awareness of others. In our normal consciousness, we are not even aware of this mental activity because it is occurring at a slightly unconscious level. During meditation, you will discover the many layers of thoughts that occupy your consciousness as well as those that bubble up from your subconscious. Once we discover the unproductive background noise that persists continuously in our mind, we can temporarily erase the distractions and find peaceful relaxation. We slow down our mind and create space within the mind to develop deeper awareness. This helps the mind to rest and the physical body to relax. With regular practice, this peaceful state of mind begins to persist beyond meditation sessions. Over time, we notice subtle yet profound changes occurring in our life. 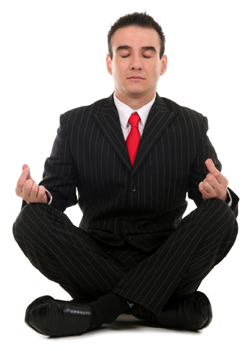 These benefits, while difficult to articulate, are very real to even the novice meditator. It is impossible to conceptualize what goes on during meditation without a discussion of the mind and consciousness. The problem with this is that it's hard to define or even describe the mind in concrete terms. There tends to be two diverse viewpoints on what the mind is. At one extreme, we have the functionalist view that says mind is defined entirely by underlying neurological activity and more specifically, by human brain function. This view is supported by the scientific community and there is plenty of research to support this position. There are continuous new discoveries unlocking the mysteries of the brain giving us more insight to how it controls our thoughts, feelings and emotions. On the other extreme is the expanded view that says that the mind is separate from the body and in fact, survives the body. The expanded view tends to be supported by Theologists and spiritualists and has various ramifications regarding life, death and what makes us human. For the purposes of the 100 Breaths Meditation System, it is not necessary to have an absolute understanding of what the mind is or is not. In fact, all that is required is to have a conceptual understanding of the mind so that we may learn and practice the techniques. 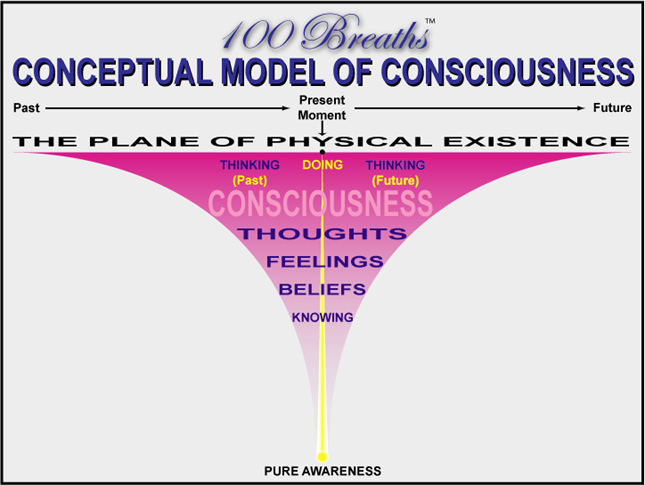 To gain conceptual understanding, we use the conceptual model below to describe the mind as consciousness. Think of the mind as the sum total of your consciousness. All thinking resides within the consciousness. Although we live only in the present moment and progress physically through time, our consciousness resides in the past, present and future simultaneously. There are also different levels of consciousness. At the surface, we are more aware of our thinking. As we go deeper into consciousness, indeed down into subconscious levels, our awareness of thinking is diminished but the power of the thoughts themselves persist. These subconscious thoughts take the form of feelings, emotions and beliefs. Our core identity is best defined as pure awareness. The problem is that our awareness is largely occluded, filtered or altered by thoughts, feelings, emotions and beliefs that encompass and shield our pure awareness within our broader consciousness. Within broader consciousness our thoughts emerge within a temporal continuum that includes remembering the past and planning the future. Thoughts, feelings, emotions and beliefs color how we experience life. Pure awareness, on the other hand is absent of thought and lives only in the present moment! Eckhart Tolle has written extensively about living in the present moment as pure awareness. I highly recommend his books which include, The Power on Now, Stillness Speaks and A New Earth. Meditation is a tool that will assist you in living the life espoused by Tolle. So your core identity is simply the aspect of YOU that is pure awareness. Your mind is the broader consciousness that not only contains your awareness but also the various thoughts that control how you experience your life. Awareness is ideally fed by your 5 (or 6) senses but generally the sensory stimuli are filtered by thoughts. Awareness has the ability to perceive and know. Unfortunately, we can't always access Knowing and we don't always Perceive because our thoughts get in the way. The most pure state of awareness is Knowing without thinking or perceiving without thinking. Knowing and perceiving do not require thought. In meditation, plain and simple, we learn to shut down thought mechanisms and get in touch with our Pure Awareness. Doing this on a regular basis helps us get the incessant thinking under control and reveals numerous benefits.